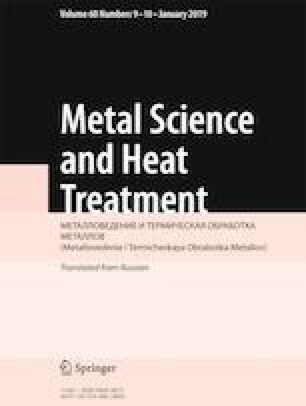 The effect of heat treatment modes of copper silumins with 4% Cu and different concentrations of silicon and magnesium crystallized in sand molds on their microstructure and mechanical properties is studied. It is shown that the level of the strength and ductility parameters of the copper silumins after the treatment depends primarily on the degree of dissolution of phase CuAl2 and that the concentration of magnesium in copper silumins with 4% Si + 4% Cu should not exceed 0.1 – 0.12%, which is sufficient for raising the strength characteristics without noticeable degradation of the ductility. The optimum mode for aging of alloy Al – 4% Si – 3.9% Cu – 0.13% Mg (160°C, 8 h), which provides σ0.2 = 330 MPa, σr = 400 MPa and δ = 2%, is determined by computation. Translated from Metallovedenie i Termicheskaya Obrabotka Metallov, No. 9, pp. 8 – 13, September, 2018. The work has been performed with financial support of the Ministry of Education and Science of the Russian Federation within the program for raising the competitiveness of NITU “MISiS” among the leading world scientific and educational centers for 2013 – 2020 and the State Specifications for Higher Educational Institutions for 2014 – 2016.